HG is here with the guilt-free spinach dip of your dreams! 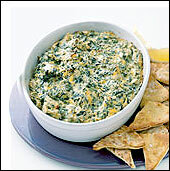 Gooey, cheesy spinach dip and tortilla chips -- it's one of the most delicious appetizers you can order. It's also one of the most fattening (Please don't be one of those people that pretends anything made with spinach can't possibly be bad for your diet!). So how can something contain mayo, cheese and sour cream, and still be guilt-free? Is it magic? Nah, just some clever substitution action, courtesy of the swap-mistress herself, Hungry Girl. In a medium-sized saucepan, melt your Monterey Jack over a low flame. In a separate pan, saute garlic and shallots with some nonstick cooking spray. Add soy milk to melted cheese, stirring continuously. Next, add mayo, sour cream and parmesan into your cheese mixture, still stirring over low heat. Add your sauteed garlic and shallots, as well as water chestnuts. Add your well-drained, chopped spinach and mix thoroughly. Spoon your dip into a medium-sized casserole dish and bake in a preheated 325-degree oven for 20-25 minutes. Voila! Your spinach-y masterpiece is complete. You may add salt and/or pepper if desired. Serves 6-8. 1. This dip is AWESOME with Guiltless Gourmet Baked Tortilla Chips or homemade baked pita chips made from Western Bagel's Alternative Pita. 2. Add a couple of tablespoons of this stuff to scrambled egg whites. It ROCKS! 3. Spoon a few tablespoons of it into well-drained Shirataki noodles; nuke for about a minute and stir well. Your cheesy spinach noodle dish will be so good it'll make you CRY! This Saturday, July 15th, is National Tapioca Pudding Day. Don't miss our special tapioca-rific email next Tuesday. HG ALERT!!!! This recipe is too good to NOT share with everyone you know. Click "send to a friend" NOW!